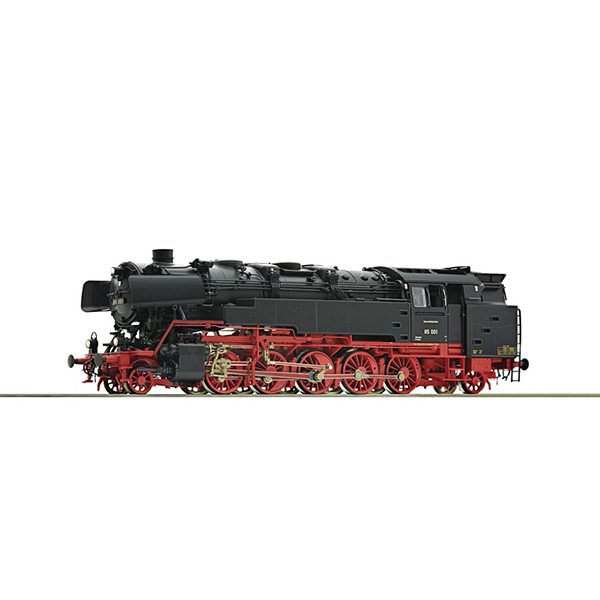 Model Description: Steam locomotive 85 001 of the German Federal Railways. Rich detailing on the model with many separately applied plug-in parts. Motor with flywheel, LED lighting and intricately elaborate wheel sets. Headlights that change over with the direction of travel, one red tail light. Coupler pocket according to NEM 362 standards and close coupling mechanism on both sides of the locomotive. The AC model is equipped with a digital-decoder and many digitally switchable sound functions and dynamic steam from the chimney. The dynamic steam from Roco provides a driving and noise synchronous smoke emission of the locomotive.